Later, the teacher confides in me, "I don't understand it. I think the children have more energy after they've had recess! Sometimes I wonder if recess is even worth it." Many teachers report that the period after recess is the absolute hardest transition time of the day. The children are often so wound up that it's hard bring their focus back to their lessons. Some teachers confess to using special techniques to calm and re-focus the children, such as dimming the lights or playing soothing music as they reenter the classroom. While these are great coping strategies to help manage the chaos, preventing episodes of amplified activity from occurring in the first place may prove to be the most beneficial. To do that, we need to allow for a longer recess session. May I boldly suggest at least an hour? 1. 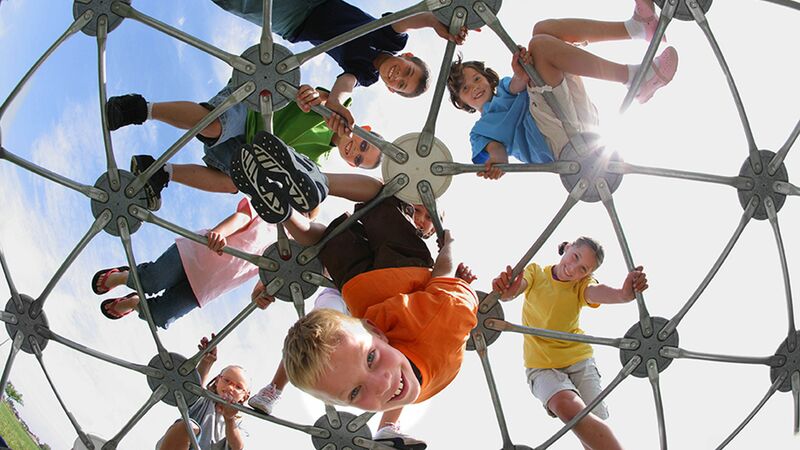 Creative Play: Recess sessions that last at least an hour have the potential to foster creative play. Many early childhood centers stress the importance of "large blocks of time (45-60 minutes)" for play throughout the day to help children develop "problem-solving skills that require persistence and engagement." Observations through our summer camp program consistently demonstrate that it takes an average of 45 minutes of free play before children dive deep into more complex and evolved play schemes. It takes time for children to figure out who they're going to play with, what they're going to play, what everyone's role will be, and finally to execute their plan. If recess lasts only 15-20 minutes, the children are just figuring out who they'll play with and what they'll do before the bell rings and recess is over. Many times, this allows for few (if any) imaginative play opportunities. 2. Social-Emotional Development: In recent years, children have exhibited more trouble reading social cues, demonstrating empathy, and effectively socializing with their peers. Schools have created special "social skills groups" to help combat this problem. However, these adult-directed gatherings that emphasize role-playing are limited in their applicability. Children learn social skills best through real-life scenarios and play opportunities with their peers. They quickly learn that whining doesn't work with friends and that they don't always get what they want. To learn effective social skills, children need plenty of opportunities to freely engage with other children. Recess, if long enough, offers an ideal environment to practice these skills. 3. Physical Regulation: Children require longer than 20 minutes of active free play in order to regulate their bodies and prepare for learning (PDF). In fact, when you first let children outdoors, their initial movement experiences will actually increase their activity levels. According to Eric Jensen's book Teaching With the Brain in Mind, "A short recess arouses students and may leave them 'hyper' and less able to concentrate." Children benefit from an extended recess session (approximately an hour in length), because it gives their bodies time to regulate the movement and bring their activity level back down again.